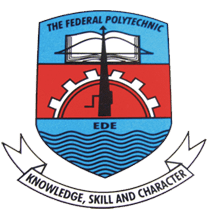 Seeking admission to the Federal Poly Ede? Below is the list of courses being run at the institution together with SSCE subjects you will need to be offered admission. SSCE or its equivalent with 5 ‘O’ level Credit passes in English Language, Mathematics, Physics and any two from Chemistry, Economics, Geography, Government/History, Further Mathematics, Biology/Agric-Science and ICT/Data processing. SSCE or its equivalent with 5 ‘O’ Level Credit Passes in English Language, Mathematics, Physics, Chemistry and any one from the following, Biology/Agricultural Science/ Animal Husbandry/ Health science, Geography and Further Mathematics. SSCE or its equivalent with 5 ‘O’ Level Credit passes in English Language, Mathematics, Geography, Biology/ Agricultural Science / Animal Husbandry and any one from the following: History, Economics/Commerce, Chemistry ,Physics, Food and Nutrition, French and Tourism/Catering Craft, Book Keeping, Account, Fine- Art, Government, Nigerian Language and Home Economics. SSCE or its equivalent with 5 ‘O’ Level Credit passes in English Language, Mathematics, one Science subject and any other two from the following : Statistics, Economics, Geography, Physics, Further Mathematics, Biology/ Agricultural, Chemistry, ICT/Data Processing, Government and History. SSCE or its equivalent with 5 ‘O’ Level Credit Passes in English Language, Mathematics, Biology,/Agric –science/Health-Science, and any one of the following: Food Nutrition, Economics/ Commerce, Physics . SSCE or its equivalent with ‘O’ Level Credit in English Language, Mathematics, Chemistry, Physics and any one from Geography, Biology/ Agricultural Science, Economics/Commerce. Minimum of four passes in English Language, Mathematics and any other two from the following: Chemistry, Physics, Biology/ Agricultural Science/Animal Husbandry, Geography, Economics, Government, Civic Education, Business Method, ICT/Data Processing Food and Nutrition/Home Economics, Statistics. SSCE or its equivalent with 5 ‘O’ Level Credit passes in English Language,Mathematics and any other three(3) subject from the following: Economic/ Commerce, Business Methods/Business Studies, Physics/Chemistry/Biology/Agricultural Science/Animal Husbandry/Fishery, Principle of Account/Book-Keeping , Government /History, Civic Education/Social Studies, Geography, Marketing. SSCE or its equivalent with 5 ‘O’ Level credit passes in English Language, Mathematic Economics /Commerce, and any other two (2) subjects from the following: Geography, Government/History, Civic Education/Social Studies, Insurance, Principle of Account/ Book- Keeping, Biology/Agricultural Science//Animal Husbandry/ Health Science/Fishery. SSCE or its equivalent with 5 ‘O’ Level Credit passes in English Language, Mathematics, and any three (3) from this following: Typewriting, Shorthand, Principle of Accounts/Book Keeping, Business methods/Business Studies, Geography, Government, History, Economics/ Commerce, Literature in English, Office Practice, CRS/IRS, Biology/ Agricultural Science/ Animal Husbandry/ Health Science, Chemistry, Physics, Insurance, Data Processing/ ICT and Civic Education/ Social Studies. SSCE or its equivalent with 5 ‘O’ Level Credit Passes in English Language, Mathematics, and any other three (3) from the following: Marketing, Economics, Commerce/ Business methods, Biology/ Agricultural Science, Geography, Principle of Account/ Book- Keeping, Government /History, Civic Education/Social Studies, Food and Nutrition, Physics, Chemistry, and Store Management and Store Keeping. SSCE or its equivalent with 5 ‘O’ Level Credit Passes in English Language, Mathematics, and any three (3) form the following: Health Science, Physics, Chemistry, Biology/ Agricultural Science/ Animal Husbandry, Economics, Literature in English, Home Economics, Food and Nutrition, Principles of Account/Book-Keeping, Insurance Commerce/ Marketing / Business Methods, Social Studies, Civic Education, Geography, Further Mathematics, Data Processing/ ICT and Government. Technical Drawing/ Fine Art, Chemistry, Biology/ Agric. Science, History and Further Mathematics. SSCE or its equivalent with 5 ‘O’ Level Credit Passes in English Language, Mathematics, Physics, and any other two from the following: Geography, Economics/Commerce, Technical Drawing/Fine Art, Building Construction, Biology, Carpentry & Joinery/ Woodwork, Block laying & concreting , I.C.T., Chemistry, and Further Mathematics. SSCE or its equivalent with 5 ‘O’ Level Credit Passes in English Language, Mathematics, Economics and any other two subjects from the following: Physics, Chemistry, Biology, Geography , Technical Drawing/ Mechanical Drawings, Fine Art, Literature, Principle of Account and Government. Quantity Surveying SSCE or its equivalent with 5 ‘O’ Level Credit Passes in English Language , Mathematics, Physics, and any two subjects of the two following: Geography, Technical Drawing/Fine Art, Chemistry, Building Construction, Biology/Agricultural, Principle of Account, Economics/ Commerce , Wood work and Government. SSCE or its equivalent with 5 ‘O’ Level Credit Passes in English Language, Mathematics, Physics, and any two subjects from the following: Technical Drawing/Fine art Geography, Economics/Commerce, ICT/Computer Development, Biology/ Agricultural Science , Chemistry and Further Mathematics. SSCE or its equivalent with 5 ‘O’ Level Credit Passes in English Language, Mathematics, and any other three (3) from the following: Fine Art, Clothing and Textile, Biology or Health Science, Chemistry, Technical Drawing, History, Government. SSCE or its equivalent with 5 ‘O’ Level Credit passes in English Language, Mathematics, Physics, Chemistry, and any other one subject from Biology/Agriculture Science, Technical Drawing, Basic Electricity, Further Mathematics, Geography and Economics/Commerce. SSCE or its equivalent with 5 ‘O’ Level Credit Passes in English Language, Mathematics, Physics, Chemistry, and any other one from Science, Geography and Technical Drawing, Wood work, Biology/Agric-Science and Further Mathematics. SSCE or its equivalent with 5 ‘O’ Level Credit Passes in English Language, Mathematics, Physics, Chemistry, and any other one subject from Biology/Agricultural Science, Further Mathematics, Geography, Economics/Commerce, Food and Nutrition. SSCE or its equivalent with 5 ‘O’ Level Credit Passes in English Language, Mathematics, Physics, Chemistry, and any other one subject form Science, Social Science, and Technical Drawing. Agric and Bio-Environmental Engineering Technology. SSCE or equivalent with 5 O’ Level Credit Passes in English Language, Mathematics, Physics, Chemistry and any other (1) from the following: Biology/Agric Science, Technical Drawing/Geography.